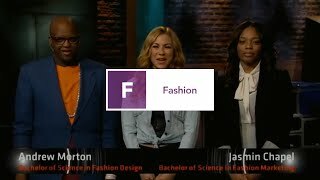 Ai Philadelphia Fashion students Andrew Morton and Jasmin Chapel go behind the scenes at music TV station FUSE. Because if you recruit enough people at least one of them will do good ON THEIR OWN. Chances are that job won’t pay the $100k+ loans he or she has incurred because of these scamsters. @SuperGameCharger because they get government money no matter if students drop out or not. thats why they recruit so hard. theyre thriving on luring in new people who realize its a scam and leave. "idiot". research it. its been all over news. Are you seriously saying this? Man, google EDMC. They own the entire scamming chain of Art Institutes. They have the highest drop out rate. Ai tries to push ANY Success they have because they let EVERYONE in to cash in on the government money. They’re about quantity not quality. EDMC is so bad they got their credit rating dropped the other day and the gov is suing them for 11 BILLION dollars.